OSR Unhinged was developed by Riddlersoft and released on December 16, 2010 for 80MSP. A copy of the game was provided by the developer for review purposes. OSR Unhinged hearkens back to the pre-Trials HD days; days where Elasto Mania and Dirtbike ruled the motorcycle physics game genre. The very soul of this game screams that it belongs in Newgrounds or some other flash-based game community, but at the same time it takes a page from its 3D brothers. It’s a simple, fun game that provides a lot of content and replay value at a very reasonable price. Flash-style graphics – Stunning 3D graphics are great, but when it comes to an indie game it’s not always necessary. People like indie games for their charm, and OSR Unhinged has plenty of it. The graphics are simple, yet colorful and effective. Think of it as extremely polished 16-bit. The game works great with these visuals thanks to the genre it came from. 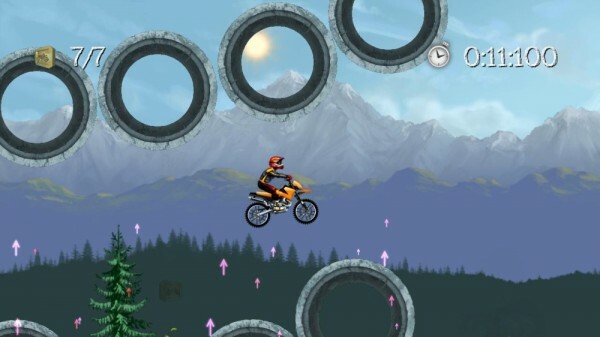 It’s not Trials – While plenty of games have tried to copy the Trials series, Unhinged goes back to the core of a bike physics game and adds its own crazy mechanics. Gone is the warehouse setting, replaced with scenery reminiscent of Super Mario World. 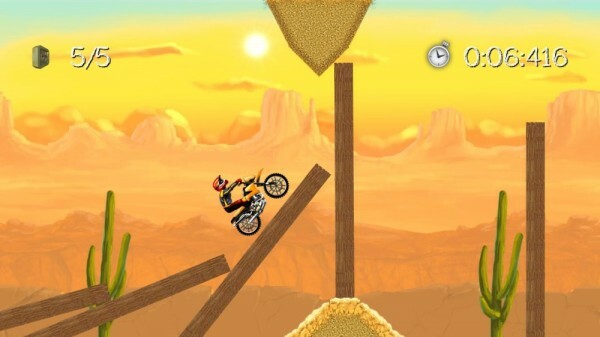 The game also features its own unique physics puzzles, relying often on wind to keep the player glued to the course, even when upside down. It’s a fun element that gives something unique to the game. Lots to do – While striving for a top time is still the focus Unhinged has a second reason to replay levels; tokens. Tokens serve as collectables which unlock 10 different bikes and several more courses. Scattered throughout each level these give players who aren’t as technically proficient an opportunity to earn unlockables along with more experienced riders. It provides a lengthy gameplay experience while not feeling artificially extended. Variety in racing – Each course is unique in Unhinged. Some are mini-planets where the player must complete multiple laps around the curve of the planet. Some use objects and physics extensively to do things such as complete a course inside a construction tube. Still others use a variety of paths to hide collectables and to throw players a loop when looking for the fastest route. 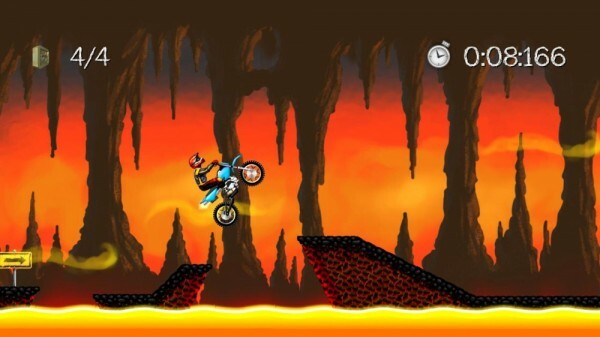 No ghost bike – Players want to learn from their mistakes. Replays and ghost bikes (or cars) in racing games help them see where they lost precious time or how they handled a jump. We were unable to find a feature like that in Unhinged, which means those hankering for precision may feel disappointed. OSR Unhinged is one of the few motorcycle physics games that’s approachable to everyone. While it can offer a challenge its secondary focus on collectables ensures everyone will be able to have a good time and unlock content. Combine that with the 16-bit charm of the visuals and you’ve got a game that nobody should pass up for the bargain price of 80MSP.